The center console of the 2014 Volkswagen Touareg is dominated by a golfball-sized knob with two settings: "On Road" and "Off Road." I had a feeling the inquiring minds of Truck Yeah! would be keen to know what it really does, so we had our test Touareg out in the muck for a spot of hooning and an off-road review. "Off Road Mode" is an activation of aggressive hill-decent speed management and special settings for the ESC, ASR, EDL, and ABS. For those who don't speak "TLA," those are Electronic Stability Control, Anti-Slip Regulation, Electronic Differential Lock, and of course Anti-Lock Brakes. Electronic throttle response is adjusted for maximum smoothness at low speed, and automatic transmission braking is made more dramatic. Brakes are applied to slipping wheels individually and power is transferred to where traction remains. It also brings up a neat little display between the main gauges with a picture of the SUV, steering angle, and text "OFF ROAD" to remind you what a badass you must be. The 2014 Touareg does not have low range gears, but with that turbo diesel V6 churning out 406 ft-lbs of torque, you're hardly short on oomph. "Off Road Mode" can be activated on the fly, but hill decent control is only active below 20 MPH. Adjustable air suspension is not available in American-market Touaregs this year. I'm not sure what kind of Colorado Kush The Fast Lane Truck guys were smoking when they described the Touareg as "cra-zy off-road worthy," but it certainly can hold its own among luxury SUVs. Approach and departure angles are both a reasonable 26˚, with a ramp breakover angle of 21˚ and maximum ground clearance of 7.9". Fording depth is an impressive 22.8"; over two inches more than a 2014 Jeep Grand Cherokee is rated for. We got the Touareg TDI across about fifty yards of river and up to its fog lights in water with no issues whatsoever, including doing three-point turns and stopping to pose for photos. 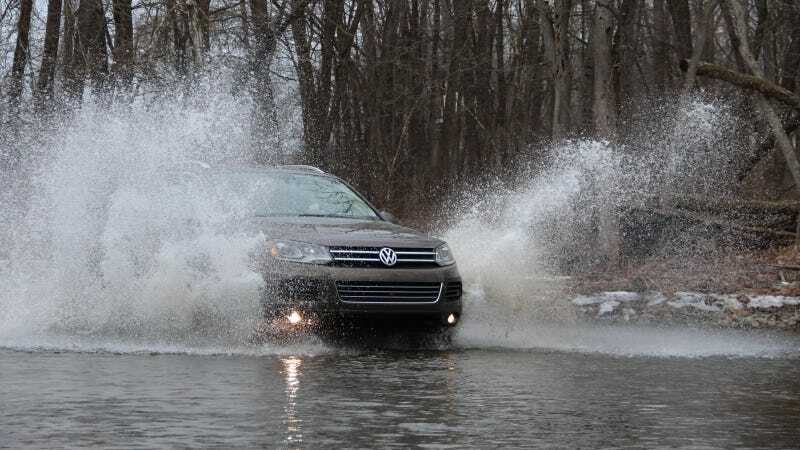 We felt a few moments of slippage, but the Touareg really didn't seem to mind even the sloppiest shallow water driving. We couldn't quite make it up the ice floes on the river's far shallow end, but we were able to back off of them easily enough when our front wheels started spinning like Scooby Doo legs. The Touareg did successfully summit some shale piles, the slipperiness of which was exacerbated by precipitation. But it wasn't easy, the SUV needed a little momentum and was more interested in burrowing into the sinkable surface than scaling it. Besides the all-season road tires, the biggest let-down here was that breakover angle; the wheelbase to ground clearance ratio just isn't right to comfortably climb a crest you'd get excited about. Obviously Volkswagen made the sacrifice here in favor of on-road usability and fuel economy. Hard to fault them for that considering most "Off Road" knobs will probably only get turned by accident, or when backing over a neighbor's flower bed. The fun police that is Traction Control puts powersliding to rest before it happens. With the system off, it is possible to break the back loose but unless you hold a turn for a full donut, the SUV pulls itself straight pretty quick. Even on icy, muddy farm tracks I could throw the wheel all over the place, do a Riverdance routine on the throttle, and pretty much recover the vehicle before any semblance of terror set in. I was impressed with how dedicated the car was to not letting me behave like an idiot. That probably sounds like great news for those of you who were planning on driving the Touareg with a latte in one hand and a bacon, egg, n' cheese in the other... but the devil's in the diesel; you can overcome the SUV's composure with enough throttle input on certain surfaces, especially downhill. In deep snow, the Touareg has no problem plowing its own path— another advantage of that robust diesel powerplant. I ran through powder up to the hubs, stopped uphill, then proceeding on again without breaking out the shovel. Down windy mountain dirt roads that never see plowing, the SUV's hill decent control made steering the vehicle as easy as if it were on dry ground. As long as I was able to keep it under 20. The 2014 Touareg TDI is a fine off-road performer as far as luxury SUVs go. I wouldn't think it could out-wheel the bigger Land Rovers, but 29 MPG on the highway is a reasonable enough excuse for that as far as I'm concerned. Here in the northeast, you're apt to drive further on bitumen just to find a dirt road before you can get any mud on your tires anyway. Speaking of tires, meatier ones would definitely help the Touareg get through thick stuff, but the maximum articulation and lack of low range will keep them off technical trails. That doesn't mean Class IV roads, rutty tracks, and creek crossings would stop the Touareg from having a good time— it's plenty capable in casual adventuring.